16" x 14" The new Philharmonic and Symphonic Series Concert Toms are offered as single-headed or double-headed toms and feature both 100% African Mahogany as well as 100% Maple shells. These Concert Toms come standard in a Matte Walnut lacquer finish, 4 Ply 5mm with 4 Ply Maple reinforcement rings, 2.3mm Super Hoop II, and a Renaissance Ambassador drumheads. The double-headed toms come outfitted with Remo Renaissance Ambassadors as batter heads and Renaissance Diplomats for resonant heads. The single-headed toms feature the I.S.S. Mounting System while the double-headed toms feature the OptiMount Mounting System. All Concert Toms are available as components and the T980W tom stand is recommended. 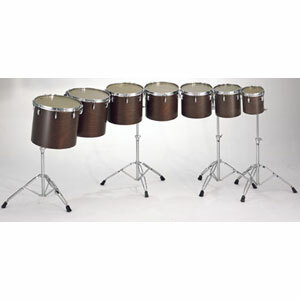 All Concert Toms come in the following sizes, 8x6, 8x8, 10x10, 10x12, 11x13, 12x14, 14x15, and 14x16. With full warm tone like this these drums are creating a new standard for concert toms.